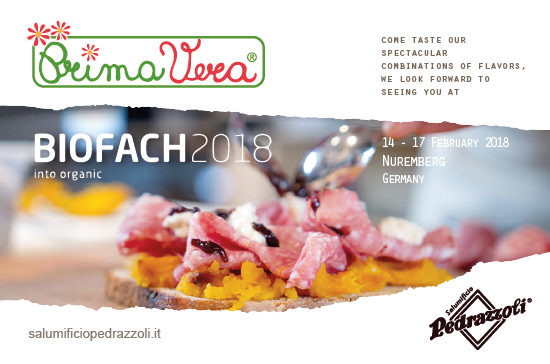 Salumificio Pedrazzoli at Biofach 2018 with many news on PrimaVeraBio! our visitors will also be honored with a small recipe book containing the sandwiches designed by chef Reponi with our salami from the PrimaVera line. From February 14th to 17th Elisa, Roberto and Davide will be pleased to welcome you at the Salumificio Pedrazzoli space at Halle 4 – stand 635.